Theresa P. of Ossining, NY is Empire City Casino’s newest multi-millionaire, having hit a record-breaking $2,919,162.81 Wheel of Fortune slots jackpot on Sunday, March 11, 2018. Theresa joins the company of millionaires Howard G. of Long Island, NY who won $1,473,503 in October 2015, and Linda H. of Thornwood, NY who took home a “nearly there” million-dollar jackpot of $961,411 in November 2016. Placing a $20 wager on the $10 denomination IGT Wheel of Fortune Triple Stars slot machine, Theresa claimed the life-changing jackpot and eclipsed Howard G.’s record win by a whopping $1.4-million, nearly double the previous record held by the Long Island resident. 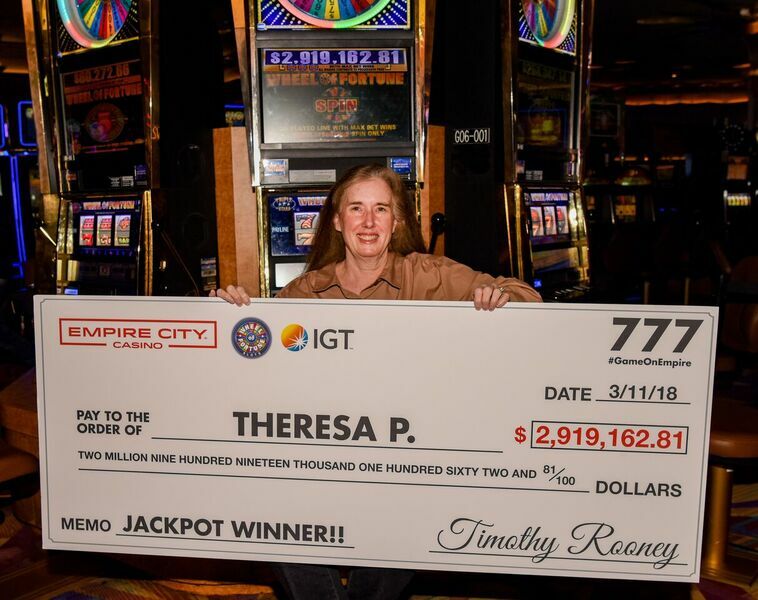 Theresa now holds the record for winning the highest-ever jackpot at any of New York State’s regulated casinos. It took only eight spins that lucky Sunday to hit the jackpot. Theresa and her husband, who have been frequenting Empire City since the casino opened in 2006, recently retired and said they plan to use their winnings to really enjoy life.